The Atron series of Decorative Wallplates offers a wide variety of colours, styles, shapes, and finishes to suit any home dicor. Long lasting, easy to mount and maintain, and an inexpensive way to add fashion. The perfect plate is available for every taste. 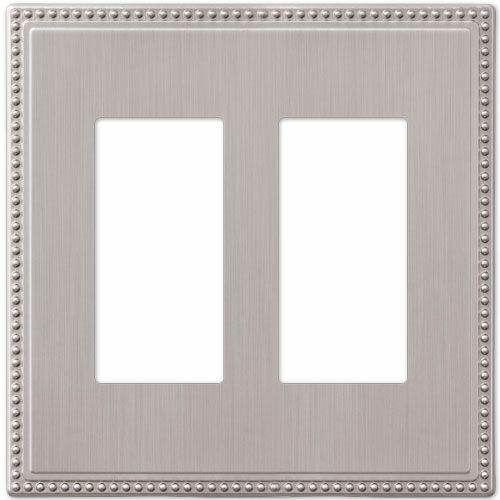 Stylish for enhancing your home dicor, finishing touches to match your Brushed Nickel fixtures and accessories with this Brushed Nickel Double Toggle style Switch plate. This 120 Volt Hampton Bay 1 light up light plugs into a standard outlet and is ideal for accent, task lighting and general applications. This lamp will add a timeless look at a great value for years to come. Perlina Cast Screwless Brushed Nickel RR This Perlina wall plate features a unique pantented screw less design. It is made out of cast zinc and composite material finished in brushed nickel.